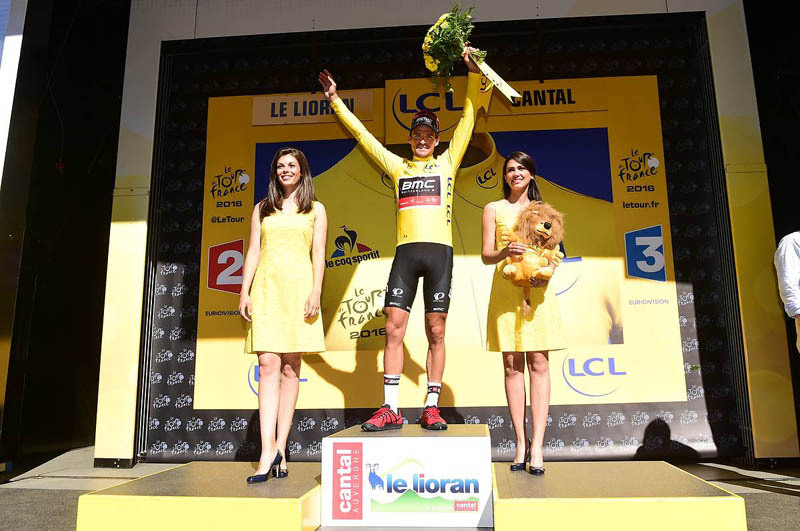 One year after he claimed his first victory at the Tour de France in stage 13 to Rodez when he outsprinted Peter Sagan, Greg van Avermaet of BMC Racing Team stepped up in the history of the race as he added the yellow jersey to his brilliant solo win at Le Lioran, taking over from the Slovakian who led the race for three days. In the morning, he feared the stage in the Massif Central was too hard for him but it wasn't the case. He rode all his breakaway companions off in the hills. Thomas De Gendt was last to surrender with 17km to go in the ascent to col du Perthus. The last yellow jersey holder from Belgium was Jan Bakelants in 2013. This is the fifth yellow jersey in the history of the BMC Racing Team after Australians Cadel Evans (one day in 2010, two in 2011) and Rohan Dennis (one day in 2015). 198 riders started stage 5 of the 103rd Tour de France. Since 2005, it didn't happen that no abandon was recorded in the first four stages. After several unsuccessful skirmishes and the passing of the côte de Saint-Léonard-de-Noblat, Raymond Poulidor's hometown where Jasper Stuyven scored one more point in the King of the Mountains classification he already led, nine riders managed to go clear at km 21: Andriy Grivko (Astana), Rafal Majka (Tinkoff), Cyril Gautier (AG2R-La Mondiale), Greg van Avermaet (BMC), Serge Pauwels (Dimension Data), Bartosz Huzarski (Bora-Argon 18), Thomas De Gendt (Lotto-Soudal), Romain Sicard (Direct Energie) and Florian Vachon (Fortuneo-Vital Concept). The front group split at km 85 after a few arguments between the riders. Three of them rode away: Grivko, Van Avermaet and De Gendt. Van Avermaet attacked De Gendt to go solo in the ascent to the col du Perthus (cat. 3) with 17km to go. It was a 1-2 for Belgium, the first since stage 2 of the 2007 Tour de France when Gert Steegmans won in Gent ahead of Tom Boonen, as De Gendt managed to stay ahead of the group of the favourites, 2.35 behind his compatriot. 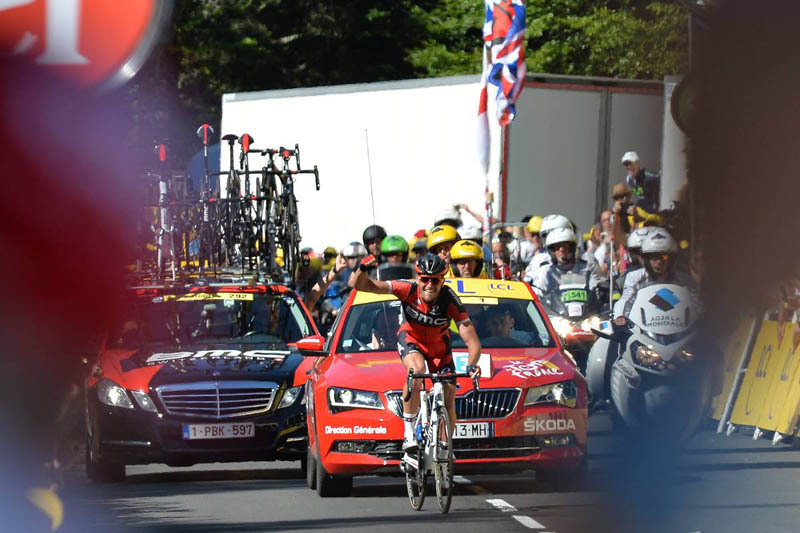 This was only the second time the Tour de France had a stage finish at Le Lioran so Van Avermaet made it a 100% for Belgium in the ski resort of the Cantal province where Romain Bardet hails from. The Frenchman accelerated in the last climb. His action was too strong for Alberto Contador who lost 26 seconds while the remaining GC contenders crossed the line with the same time. Van Avermaet has 5.11 lead over Julian Alaphilippe in the overall ranking. 4 Joaquin Rodriguez (Esp) Team Katusha s.t. 23 Louis Meintjes (RSA) Lampre - Merida all s.t. 41 Haimar Zubeldia (Esp) Trek-Segafredo all s.t. 46 Steve Morabito (Sui) FDJ all s.t. 50 Luis-Leon Sanchez (Esp) Astana Pro Team s.t. 55 Mikael Cherel (Fra) AG2R La Mondiale all s.t. 74 Robert Kiserlovski (Cro) Tinkoff all s.t. 79 George Bennett (NZl) Team LottoNl-Jumbo s.t. 110 Peter Sagan (Svk) Tinkoff all s.t. 172 Sondre Holst Enger (Nor) IAM Cycling all s.t. 175 Cyril Lemoine (Fra) Cofidis, Solutions Credits s.t. 197 Angelo Tulik (Fra) Direct Energie all s.t. 16 Sergio Henao Montoya (Col) Team Sky all s.t. 21 Thibaut Pinot (Fra) FDJ all s.t. 33 Haimar Zubeldia (Esp) Trek-Segafredo all s.t. 42 Steve Morabito (Sui) FDJ s.t. 48 Arnold Jeannesson (Fra) Cofidis, Solutions Credits s.t. 83 Michael Matthews (Aus) Orica-BikeExchange both s.t. 85 Anthony Roux (Fra) FDJ s.t. 92 Edvald Boasson Hagen (Nor) Team Dimension Data s.t. 102 William Bonnet (Fra) FDJ both s.t. 109 Paul Martens (Ger) Team LottoNl-Jumbo s.t. 114 Ramunas Navardauskas (Ltu) Cannondale Drapac Team s.t. 124 Vasil Kiryienka (Blr) Team Sky s.t. 130 Jerome Coppel (Fra) IAM Cycling s.t. 136 Antoine Duchesne (Can) Direct Energie s.t. 161 Ramon Sinkeldam (Ned) Team Giant-Alpecin s.t. 170 Davide Cimolai (Ita) Lampre - Merida s.t.